One day I was doing some activity on the floor of my living room (let’s say it was exercise). 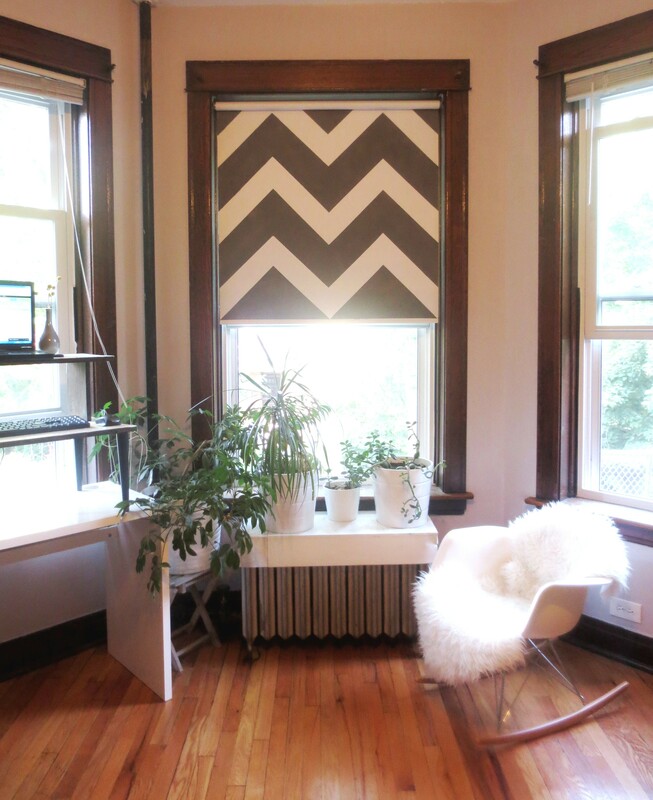 I stared long and hard at our white vinyl roller shades. They serve a very important function: keeping the blazing sun and heat out in the summer, and allowing us to shamelessly prance around in our underwear during the endless night of our Chicago winters. They ain’t pretty, but they get the job done. But the longer I stared, the more I realized that our roller shades were actually retractable blank canvases. Of course we took the Christmas lights down AFTER I took this picture. How could I have gone this long without seeing the creative possibilities lurking in almost every window in our home? 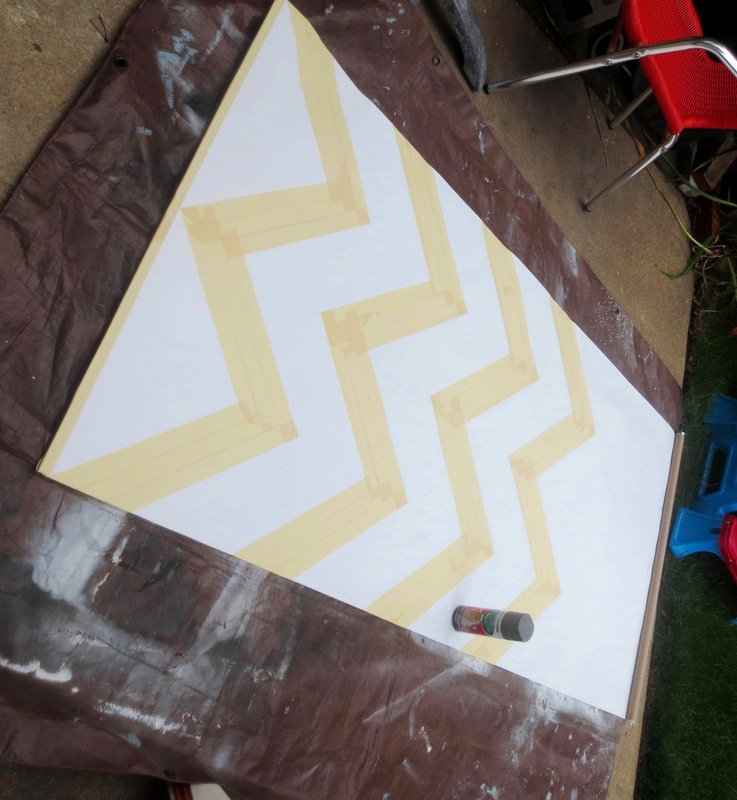 All I needed was some masking tape, spray paint and an unhealthy obsession with chevrons. Why spray paint? I had been pondering this project for a while, but didn’t trust the effects of regular latex wall paint. Then last month, I was in the suburbs buying up spray paint for myself and my other inner-city friends** and stumbled upon this paint made especially for fabric and vinyl. I grabbed a can in grey – my favorite decorating color. After a few weeks of procrastination, I was ready to paint. STEP ONE — PREPARE: Take the shade out of its bracket, but first, put some pants on because you will be standing on a ladder in front of the window. I once saw a naked man changing a light bulb on a ladder in front of his window and it is an image that I can never forget. As with all painting projects, we must create a welcoming surface for your paint – clean, dry, and free of any grease or dust. After a few seconds of internet research, I determined that the safest way to clean vinyl shades, especially the “blackout” shades that we have, is with water and a sponge, and maybe a little bit of mild dish soap. 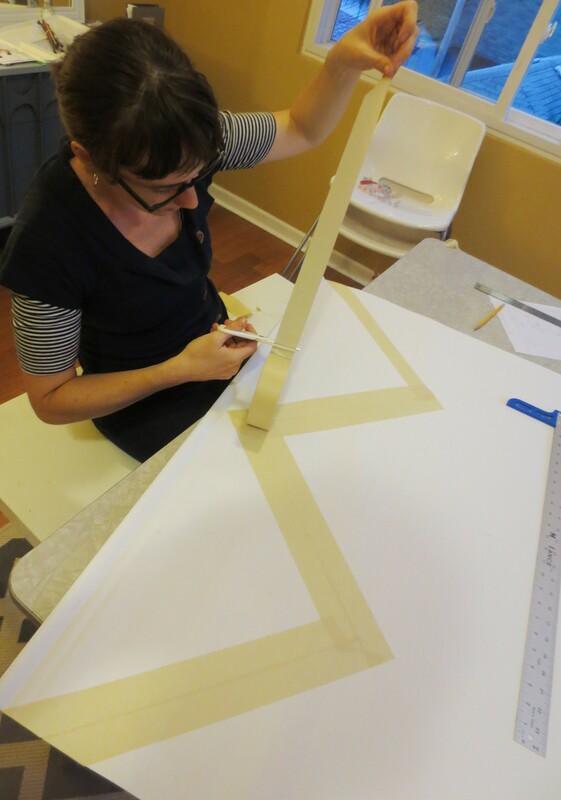 STEP TWO — MEASURE: Measure the width of your shades and determine the length of the shade that will actually hang down. For example, since my window is only 70” tall, in practice, I’ll never actually see more than 70” of shade. Pick a design. Chevrons are trendy now, but it doesn’t mean they are not fantastic. I also love that the word CHEVRON has a chevron right in the middle of the word (at least in English). Like a visual onomatopoeia! 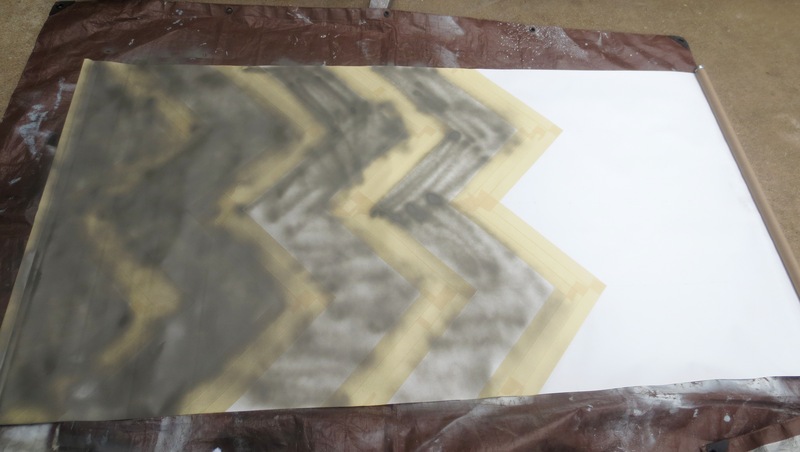 To set the pattern, take the width of your shade and divide by the number of points you want your chevrons to have. 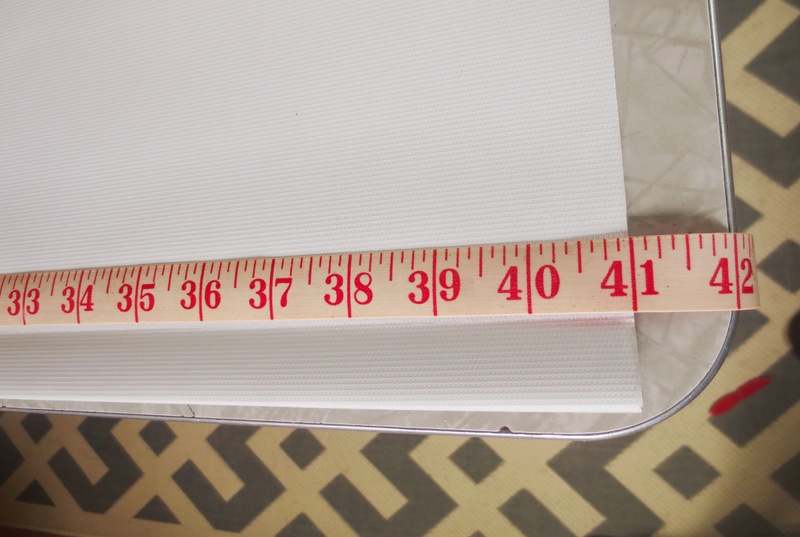 My shade was 41 inches wide, so I divided that in half (20.5″) and then in half again (10.25″). I marked four spots with a pencil on the bottom of the shade, each 10.25 inches apart. Pencil a line up the shade from each of the four points on the bottom to make sure you are staying straight. I also decided that I wanted 10 inches of white space between my chevrons. This is completely arbitrary, it just seemed like a nice even number, and not cursed or culturally significant. STEP THREE — TAPE: You could cut the masking tape as you go, but I find it easier to cut off a bunch of strips at once and have them handy for mass application. But don’t just tear it off like a savage– cut the tape with a scissors at a straight 90 degree angle (cutting freehand worked for me). Next, line up the bottom of your tape so that one end meets the bottom corner of the shade, and the other end meets the apex of the first chevron, then smooth out the tape. 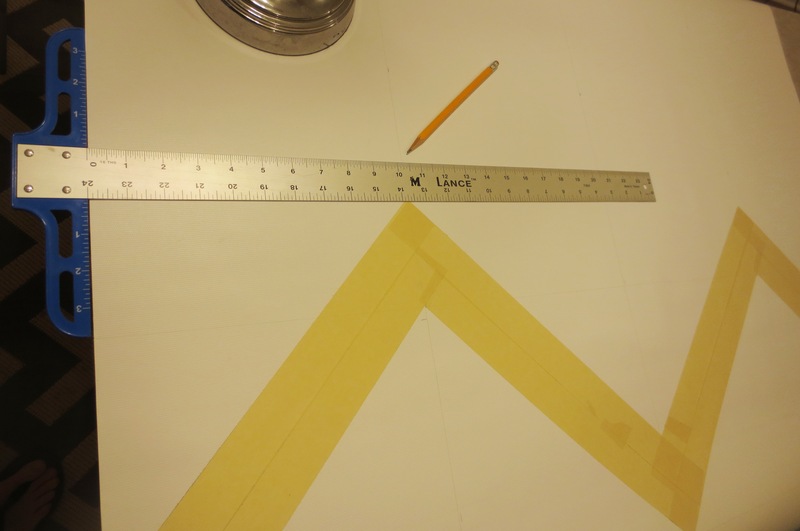 Use another strip to make the “down angle” of the chevron – again meeting at the apex and then at the bottom middle point of the shade (for my 41 inch shade that was the 20.5 inch-point). At this point you can add as many strips as you like to achieve the desired chevron thickness. As you can see, I started with two strips of tape, then finished and realized I wanted it thicker. Easy enough to do, I just applied another strip to each “arm” (or wing?) of the chevron. To create the next line of chevrons, just measure 10 inches from the apex (top point) of your first row of chevrons. 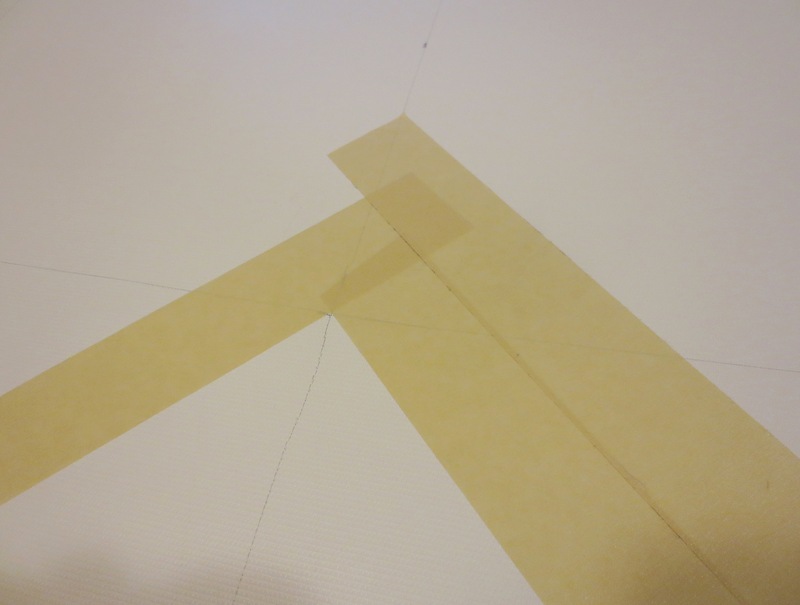 Draw a line horizontally across connecting the two marks (check to make sure it’s roughly level) and start taping again. Repeat as many times as you like. I didn’t tape all the way to the top of my shade because (1) I’m Lazy, and (2) I thought it would add visual interest to have a white space at the top. But mostly I just wanted to finish taping and watch the first episode of Breaking Bad Season 5 before it was time to go to bed. 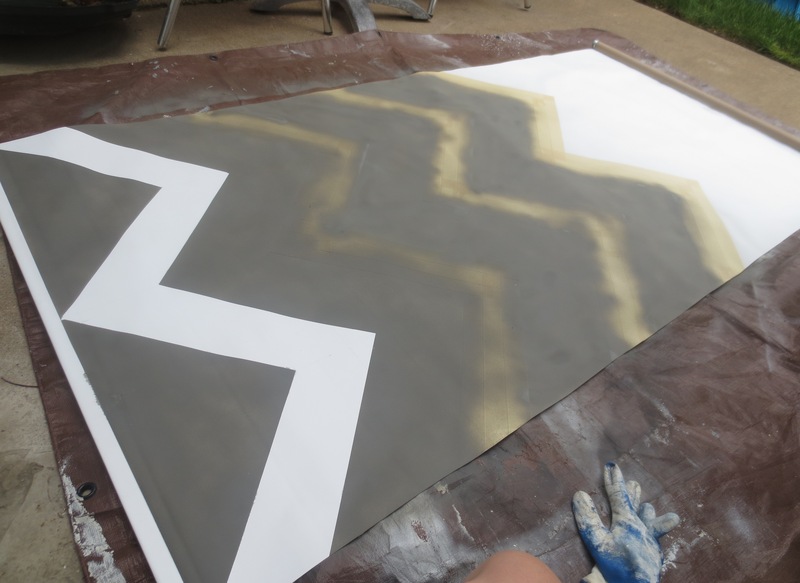 STEP FOUR — PAINT: Lay your shade down on a tarp outside or in a REALLY well ventilated area, like a garage with the door open. 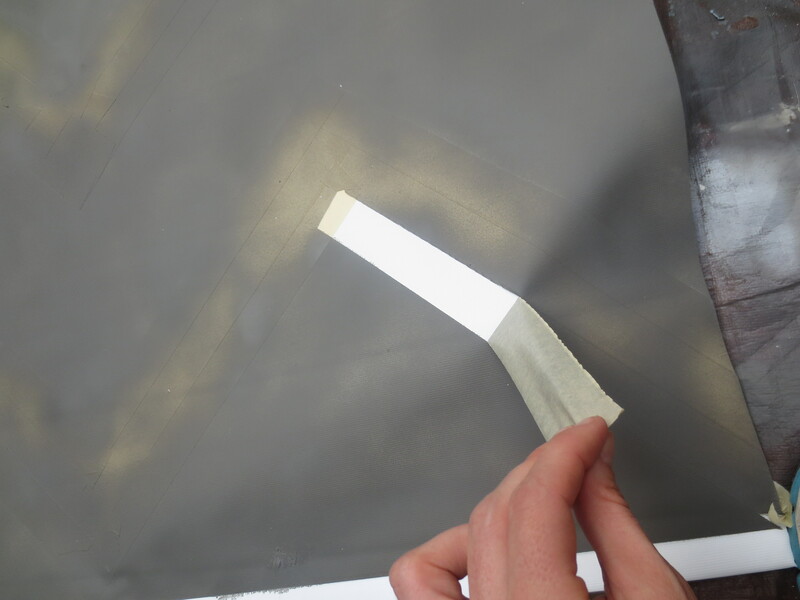 Run your finger over the tape to make sure it is completely stuck to the shade. Complete the look with an old maternity tank top worn inside-out. After shaking your can for a minute, spray with continuous, even application. Give the whole thing a light misting, then go back to where you started and do it again. Repeat until you either run out of paint or you’re satisfied with the results. ANOTHER PRO TIP: There really isn’t that much paint in a single can. I realized I was running out and made a quick decision to leave the very top of the shade white; otherwise, I would have to somehow get to the suburbs to get a replacement can. I actually like the way it turned out, but do yourself a favor and buy two cans. 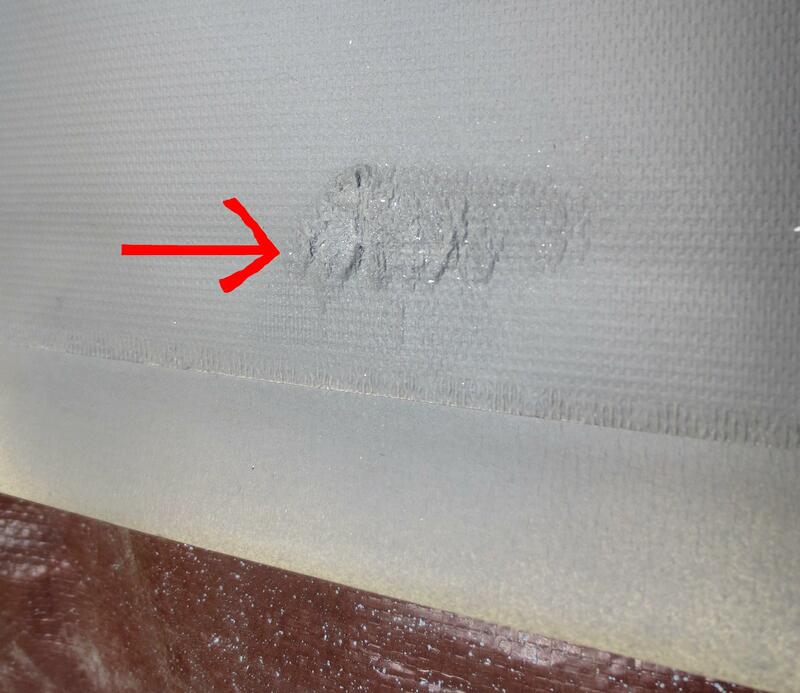 Also, if you feel yourself running low, make sure you fully coat the areas where the masking tape meets the shade. As long as you have crisply-lined edges, the middle of the chevrons won’t be as noticeable if they’re a bit splotchy. 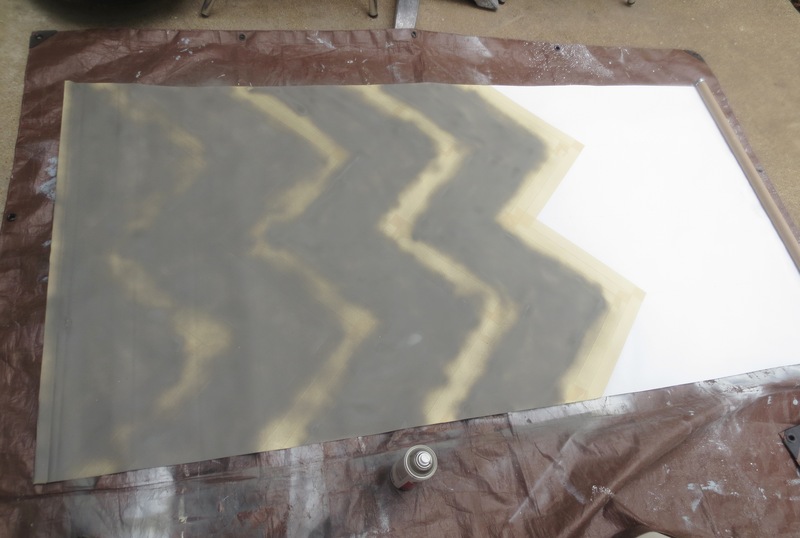 Lucky for you, spray paint dries almost instantly when applied in thin, even coats. This means you can start pulling off your masking tape after a few minutes, or when you can feel that the paint is dry to the touch. I LOVE pulling masking tape off! It feels like I am giving my shade a face lift and am pulling off the bandages. Since I’m neither wealthy nor weird enough to consider plastic surgery on myself, this is a pretty big thrill for me. When pulling up the tape, start with the last piece of tape you applied – in this case the top layer of the three layers in each branch of the chevron. Since the strips of tape are overlapped, this will keep you from pulling up the edges of the neighboring tape. Seriously — I can’t believe how good this turned out. Wait—you’re not done yet! When you’ve finished peeling, clean off the back of the shade with a damp sponge. My tarp was covered in a very fine layer of wood dust from my recent MCM Credenza Makeover project, which of course stuck to the back of the vinyl shade. Remember that as you roll the shade up, the back will rub all over the front, so keep it clean. Finally, erase all the pencil marks you made in step two, and — with your pants still on — hang your beautiful artwork up in the window! ** Loyal readers know that you can’t buy spray paint within Chicago city limits, which I almost never leave. That really looks beautiful! Never thought of such a cool idea – very clever! Now I want my shades back that I got rid of to buy curtains. That is so cool! And so easy to do. Wow! Not to ask a dumb question, but why can’t you buy spray paint in Chicago? Is that a weird law or something? Not a dumb question at all. Fun Chicago facts: the City Council banned the sale of spray paint in 1992. Spray paint manufacturers sued, and the law was ruled unconstitutional (interfering with interstate commerce). 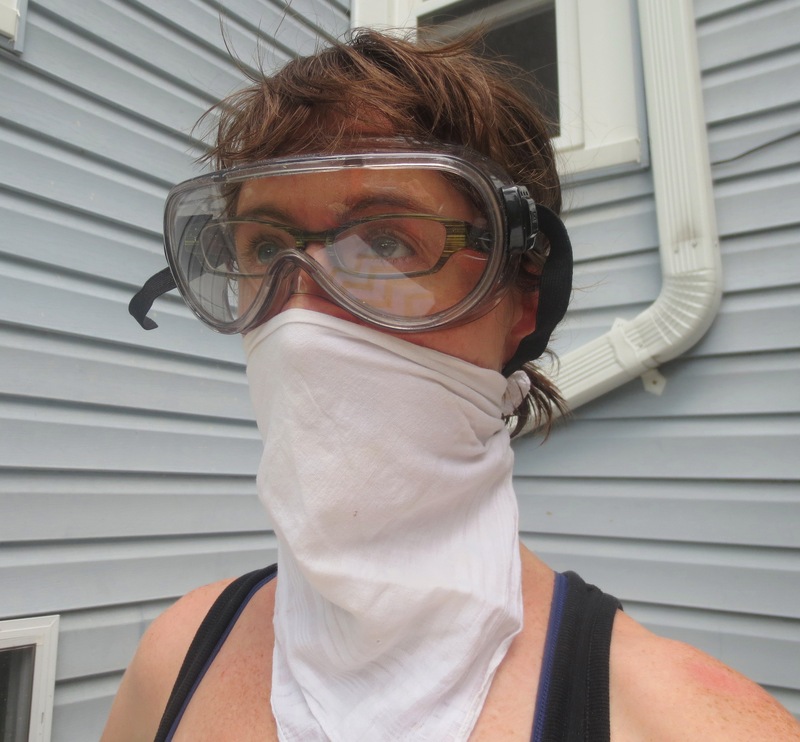 The city appealed, and the spray paint ban was then upheld by the U.S. SUPREME COURT in 1995. And that is why I have to buy ten cans of spray paint whenever we visit my sister-in-law in the suburbs! Good grief. That’s just punishing the folks who want to use it for regular projects because if you really want spray paint for nefarious purposes, you can still go buy it in the suburbs, as you say, and bring your ‘contraband’ back into the city. I get mad when I have to run out mid-project and drive 10 minutes to my local Lowe’s to get more. I can’t imagine driving 45 minutes (maybe more?) and fighting a bunch of traffic just for a can of spray paint! Super-sized Coke bans in NYC get struck-down but spray paint sales bans in Chicago are upheld. Personally, I think both are dumb but sometimes the mind reels… Thanks for clarifying! Yeah, it’s a pain. Aside from the paint manufacturers, there’s no group organized to fight the spray paint ban, and now its 20 years old. Maybe all the crafters and DIYers should team up with the taggers to lobby for repeal. A couple of years ago, a Chicago alderman proposed banning the sale of those little plastic ziploc baggies — the kind used by both drug dealers and jewelry/craft folks. It never passed, but I had quite a chuckle imagining a bunch of gangbangers and Etsy beaders joining forces at a city council hearing. Let’s hear it for unintended consequences! I would imagine it’s actually a pretty effective law. Often the people who want to tag surfaces don’t have a lot of money or access to a car. Of course someone who is really dedicated will find a way, but those people are the minority – most vandalism is done by dumb teens who aren’t going to put a lot of time or energy into it. Other cities will require you to be 18 to buy spray paint for the same reason. It’s still really annoying though. Love it! Why don’t you trust the effects of latex paint? I need to paint the entire shade (old & yellowed) first and was considering latex. Any suggestions? I think latex is great for walls (because they don’t move or generally get much wear-and-tear), or for furniture that will also be covered in a protective clear coat, like Polyurethane. But latex on its own doesn’t do well under lots of movement or friction. And since the rolling shade is constantly rolling down and up, my feeling is that it would peel and tear very quickly. Latex also doesn’t seem to adhere to smooth surfaces as well as oil-based paints, which is why I usually slap on a coat of oil-based primer before I paint any furniture. The oil-based primer really “grabs” onto the surface. And to be honest, when I saw the can of paint that was labeled especially for vinyl and fabric, I just grabbed it. Who knows if it’s really any different than ordinary (oil-based) spray paint, but I was willing to take a leap of faith. I’m now staring at the shade two+ months later and it still looks good. It’s covering the middle window of our front living room, so I usually pull it down every night for privacy, especially now that the leaves are all falling! Hello! 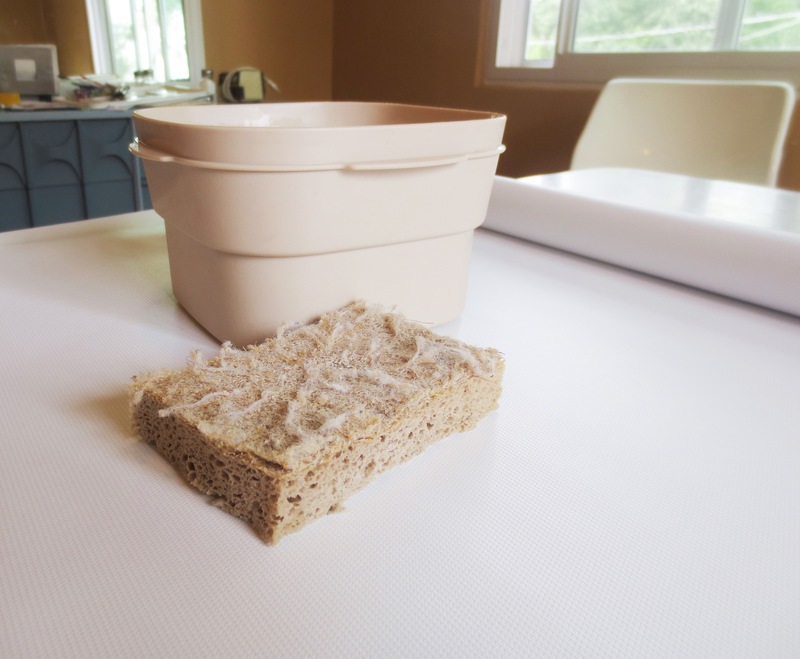 Thank you for sharing this amazing DIY tip. I’ve been meaning to replace my ugly roller blinds for some time now, instead I will definitely repaint them 🙂 i really like the final effect of your gray spray paint and design as well. Looks fantastic and very fresh 🙂 great job! Great idea! We actually just moved from that apartment into our very own (scary, old) house a few blocks away. It’s full of old vinyl shades that are in various states of decay. So, they’ll be replaced sometime soon, but wouldn’t it be fun to let artists or children (OK, maybe not children) create some statement pieces while they’re still up? It also makes me wonder if the people who moved into our old apartment have pulled that shade down yet? They may not even know about the fabulous design hiding right in plain sight! I LOVE this! 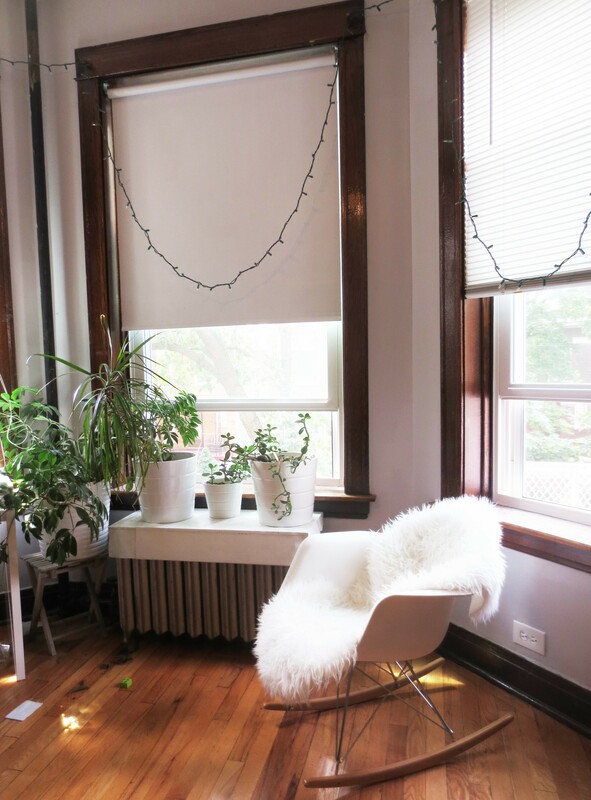 I have baseboard heaters and would like to replace my curtains with shades that won’t cover up the heating units below the windows, and vinyl shades are so very cost effective but not pretty. So, it sounds like your painted shades were still in good shape when you moved? Yes, they were still in perfect condition as of 4 months ago! I’ve also used that same vinyl paint on a chair cushion, and after a year it’s also still in great shape. Go for it! I want a roll-down green screen (I make gaming youtube videos, and when I have facecam on, I can “delete” the background with a green screen). But I can’t find any roller shades in chroma green. Therefore I’m thinking about buying a white roller shade, and paint it chroma green. The only white roller shades I can find (and afford) is 100% polyester. Will paint from a spray can hold? Or will it start to crack, when I’ve rolled it up and down a few times? 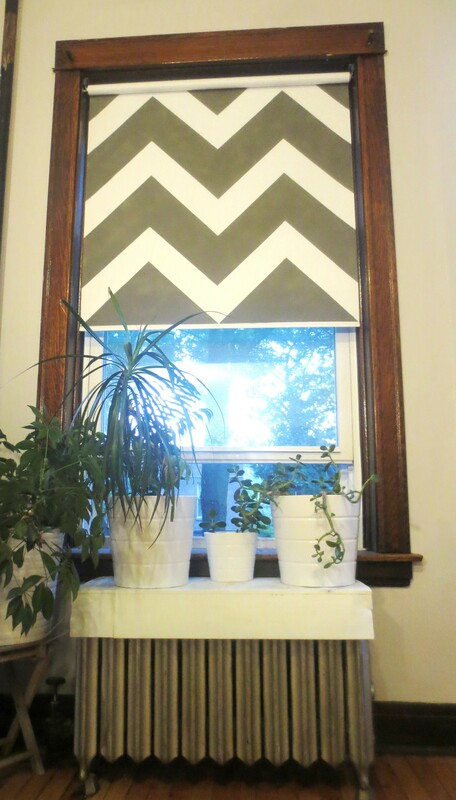 My other idea is to buy the white roller shade and some chroma green fabric, and sew it on. Do you think this will work, if spray paint won’t? Or do you thing the extra fabric will make the curtain too heavy? I think a roll-down green screen is a great idea! And yes, I think you CAN spray paint it. 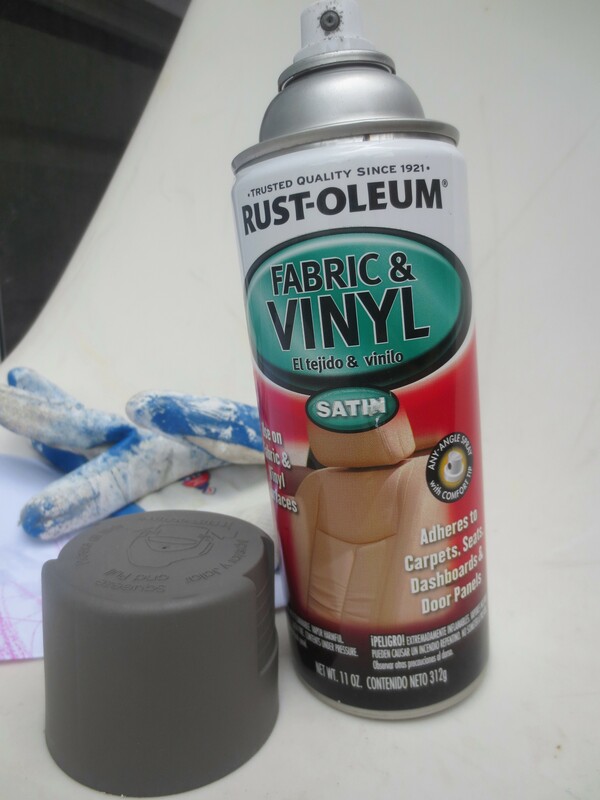 However, I strongly recommend that you find spray paint specifically for vinyl or fabric. I’ve used it several times (on a vinyl chair and also on roller shades) and it’s held up well. The only problem is that you’ll find a very limited selection of colors in vinyl spray paint. So you may not be able to find the color you want. If you don’t plan to roll the shade up and down all the time, perhaps traditional spray paint would work fine. I only worry about it if the surface gets a lot of wear-and-tear, like rolling up and down constantly. In that case, maybe fabric is the way to go. Good luck on your project! I’ve had an idea for a window treatment for a very long time, and I don’t know why someone hasn’t thought of it before. It’s simply this: transfer the image of a master painting onto a white window shade. If the shade is pulled down during the day, it will glisten with color and imagery. If it’s pulled down at night, the light in the room will make the colors dance. It will also eliminate the need for any kind of curtain or drape. How does one transfer an image to the shade? Sorry, not tech savvy, if this is how you do it. I used regular spray paint before I read this article and it turned out sticky. So glad I found this! My ugly, all-white kitchen in my rental needed a pop of color and giving my shades a facelift really did the trick! So glad to hear it! It’s amazing what a difference it makes. I’ve had this idea for years and never thought it would work, you young’uns just don’t understand the amazing impact of the web! Thank you for your helpful and humorous directions. My pleasure! We are still using that shade and the paint is still perfect. Who knew? 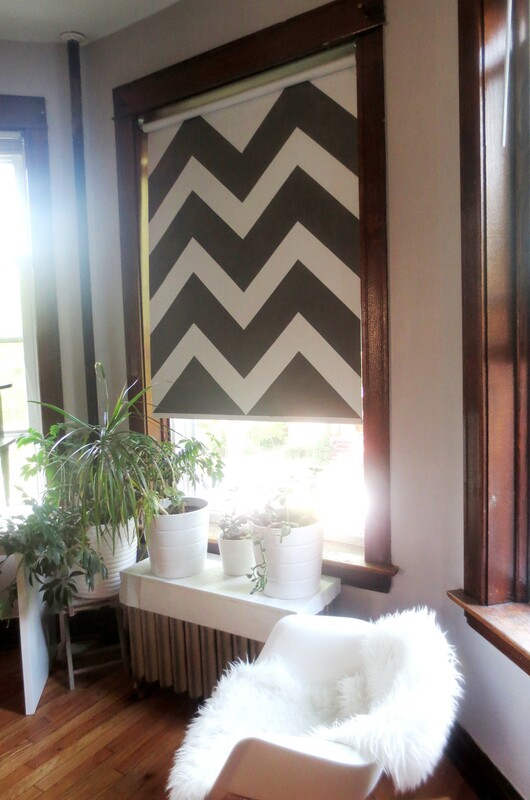 I am totally doing this to my grey ikea black out blind! i think this is the greatest low cost idea with so many design potentials..
What a great idea and all your photos and instructions are so helpful! Now that its been almost four years how is the paint holding up? I live in Florida and I’m wondering if the paint will peel in our sunny windows. Hi Diane, this blog post is a little dated. That was in our last apartment. We moved about a year and a half later, and the shade was still in great shape. My shades rolled in on the sides! What did I do wrong? Thank you. They curled in, more specifically. 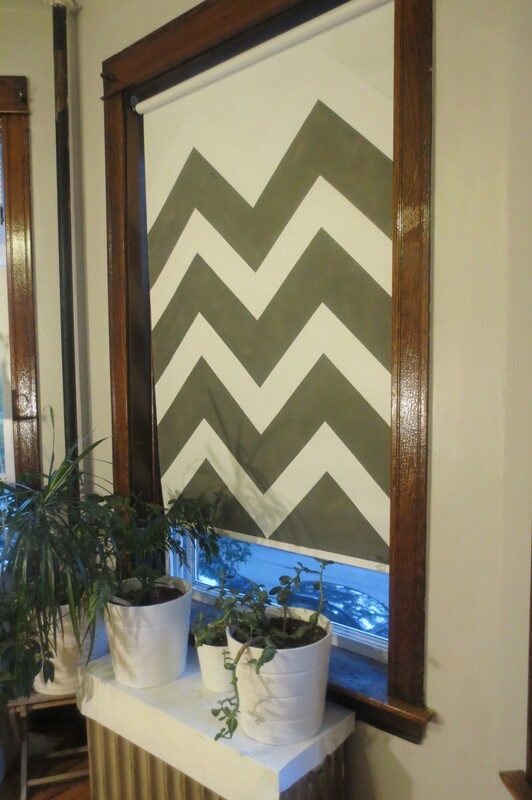 What’s up,I log on to your blog named “Turn Your Ugly Vinyl Roller Shade into a Work of Art | projectophile” regularly.Your story-telling style is awesome, keep up the good work! And you can look our website about تحميل افلام. Great job Clare, thanks for the inspiration. In Australia the stores that sell spray paint have to lock it away, buyers must be over 18 (graffiti bandits) if found to sell the stores are fined. What good info you have for us…..and fun! I have so much fun spray painting things, that my husband says he will spray paint my coffin for me! He can use that new spray stain! I sprayed upholstery lately! Turned a mauve upholstered Queen Anne bench black……turned dusty blue Queen Anne recliners hunter green! Talk about changing scenery and saving money! My husband installed boardroom paneling in our living room. So…..my white roller shades are NOT going to cut it. With cranberry carpet, the shades can become solid navy (like the sofa), hunter green (like those chairs- though that might be an excess of the green), or brown like the woodwork. Regardless of color, a Greek key narrow border in black, or something similar, will add to the library look. Your chevron experience is very helpful AND entertaining!